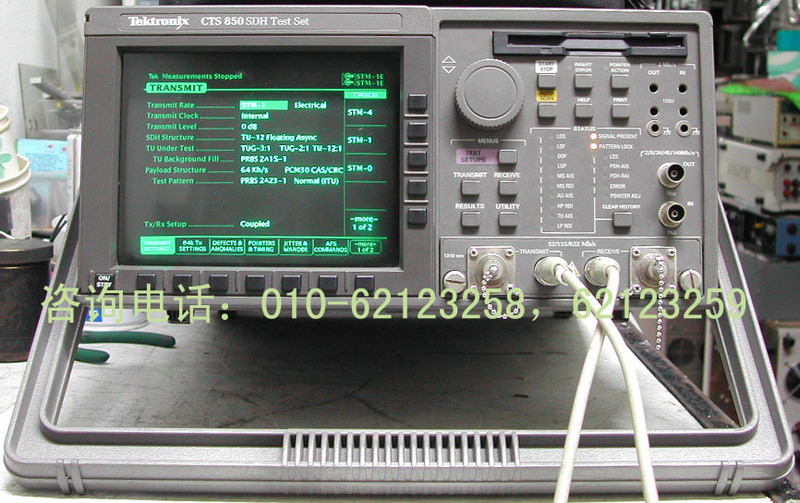 The CTS850 is a versatile analyzer for Broadband Network Testing. It has a powerful, yet uncomplicated, menu structure which allows both the novice and expert user to accurately configure measurements on SDH and PDH networks very quickly. All measurement connections are conveniently located directly on the front panel close to the signal status LEDs and easy-to-read display. A field-interchangeable optical module and a floppy disk drive for retrieval of stored setups and results complete the front-panel layout to create a "field-friendly" instrument. The CTS850 creatively addresses growing concerns surrounding hybrid SDH/PDH networks in the area of timing and synchronization. Its industry-leading, DSP-based, Jitter and Wander measurement capability provides a high 300 UI jitter measurement range, handles all line rates from 2 MBps to 622 MBps through existing front-panel connectors and introduces exclusive new measurements for digital video services. The CTS850 unlocks the power of the SDH frame structure by combining bit error testing with overhead analysis and payload mapping and demapping. It provides read/write access to overhead bytes, DCC add/drop, and complete G.783 pointer test sequences. The CTS850 is optimized for installation and maintenance of both current and future SDH networks. Additional functionality, reflecting evolving standards such as new O.172, can be downloaded through the built-in disk drive. One of the CTS850's many powerful functions is error analysis and display. In addition to simple error counts and rate determination, the CTS850 makes measurements according to G.821, G.826, G.827, and new M.2101.1 performance analysis and M.2100 error analysis so that network quality of service can be fully verified in or out of service. Histograms boost the power of error analysis by enabling an easy correlation of time-critical events. Thus, time-consuming searches through long strips of error printouts are eliminated, freeing you to spend time fixing problems, not finding the cause. Many networks have evolved from PDH to include SDH rings and long-distance, high-capacity trunks. The PDH network segments are commonly retained for access, service delivery, and economic reasons. The CTS850 Opt. 38, PDH Tributary card provides features for testing and accessing PDH subrates from 140 MBps, 34 MBps, 8 MBps, 2 MBps, down to N/M × 64 Kbps. Additional PDH test features also include simultaneous multilayer G.826, M.2100 results, Round Trip Delay, Voice Channel Monitor, and Burst FAS Errors. This option also empowers the CTS850 with mapping and demapping of 2, 34, and 140 MBps payloads in virtual containers and testing of TU-12, TU-3 and AU-4 overheads, making it ideal for testing hybrid networks. To support current and emerging ITU-T and ETSI standards, CTS850 Opt. 14 for Jitter and Wander provides the most comprehensive, easy-to-use measurements for both SDH and PDH equipment and networks. The CTS850 is the first test set to fully conform to the requirements of the new ITU-T O.172 (Jitter/wander test for SDH networks). So for the first time, measurements of pointer jitter can be made reliably and accurately. Widely variable results are a thing of the past. With its wide-ranging and comprehensive generation, analysis, pointer movement, automated jitter output, transfer, and tolerance testing, the CTS850 is the complete solution for your current and future test requirements. Also included in Opt. 14 is Real-Time Wander Analyst application software for MTIE and TDEV parameter analysis. Now you can fully test and qualify the timing and synchronization of your new SDH/PDH equipment and networks. Jitter history histograms can be correlated with simultaneously-acquired Wander TIE data so troublesome conditions can be quickly diagnosed. Digital video services demand a more stringent level of SDH/PDH timing and synchronization performance than many other services. The CTS850 Opt. 14 provides exclusive new measurements at the network interface to assess video service performance. Also, CTS850 Opt. 55, provides the ability to test 45 MBps Mapping and Demapping, including Jitter and Wander testing, to bring the CTS850's advanced benefits to Video Service Measurement. Graphical display of AU/TU payload and alarms (AutoScan) Provides the fastest signal identification. Allows quick identification of incorrect provisioning and easy location of the customer's signal path. Pass/fail tests can be created, stored, and executed in the field Ensures a uniform test methodology in an increasingly diverse network. Allows faster installation and responsive maintenance. 3.5-in. floppy disk drive Distribute firmware updates in the field. Archive pass/fail tests and test results. Document operating- and result-screen bitmaps. Measurement histograms with up to 1-second resolution Allows visual presentation of measurement results to customers. Correlate alarms, errors, pointer movements, etc. Cleanly structured menu system Enables all users (technicians, experts and occasional users) to be immediately productive. Large, bright CRT user interface Easy-to-see in low lighting conditions. Histogram resolution is clearly visible. STM-0, STM-1, and STM-4 Transmit and Receive STM-0 (51 MBps) is becoming more prevalent in radio links/ subsystems and SDH access systems. STM-16 Transmit and Receive (with ST2400A) Test STM-1/4 payloads in STM-16 ring. Performance analysis to G.821, G.826, and new M.2101.1, M.2100 error analysis on all SDH/PDH layers simultaneously Simplified testing for correct error performance compliance on both in-service and out-of-service systems. Pointer test sequences exceed requirements of G.783 Thoroughly stress the margins of equipment performance. SDH/PDH defect generation and analysis Verify correct network response at all layers. Set and detect K1/K2 bytes. Generate linear and ring messages to G.841 and G.783. Send standard network messages and monitor network response. Verify protection switching system. Interchangeable 1310 nm and 1550 nm optical interfaces Swap between Long Haul/Short Haul trunk testing. VC4-4c testing for concatenated payloads Efficiently qualify transport of concatenated 622 MBps data for IP and ATM applications. 45 MBps (DS3) Mapping/Demapping and Jitter/Wander Testing Focus on new 45 MBps services and video quality testing. Complete set of jitter and wander conformance tests with specification limits. Test 2, 8, 34, 140 MBps directly at each line rate Make traditional PDH measurements when necessary. Map unique test patterns into TU-12, TU-3, and AU-4 containers Verify correct provisioning and payload integrity. Test PDH signals dropped from SDH rates Monitor PDH services to verify tariffed performance. Add/Drop external 2, 34, and 140 MBps signals to/from SDH containers and induce timing impairments. Generate SDH test signals using customer-generated PDH traffic. Add pointer sequences, test pointer hit tolerance of terminals and desynchronizers. Mux/Demux N/M × 64 Kbps and subrate PDH signals into/out of higher-speed PDH signals Verify correct PDH multiplexer/demultiplexer service configuration for data and video conferencing. Round trip delay testing Measure round-trip delay for data and voice services. 2 MBps Channel-Associated Signaling Verify channel-busy occupancy and utilization. Exceeds new ITU-T O.172 Fully conforms with requirements of new ITU-T O.172 (jitter/wander test sets for SDH networks). DSP engine provides precise measurement filter characteristics - unlike previous O.171 test sets, pointer jitter is reliably and accurately measured. SDH/PDH Jitter and Wander testing from 2 to 622 MBps. Most complete solution in one option supports installed interfaces for both generation and analysis (including 45 MBps). Automatic built-in conformance tests for output jitter, jitter tolerance, jitter transfer, pointer jitter Perform all standard ITU-T SDH/PDH equipment and network jitter/wander tests with quick, simple pass/fail tests. Supports G.783, G.823, G.824, G.825, G.958, G.735, and G.751 specifications. New Video Timing Quality measurements: Frequency drift-rate (ppm/sec) Allows characterization of SDH networks for video applications. Correlate SDH pointer activity with video subcarrier and Hsync drift. DSP Jitter and Wander measurement technology. Standards requirements can easily be updated in firmware and distributed on a floppy disk. Measurements are more repeatable and reliable between two test sets. Allows existing customers' test sets to be firmware-upgraded to support new O.172. Combined mapping and pointer jitter testing function Allows testing of tributary jitter caused by G.783 SDH pointer test sequences together with PDH mapping frequency offset. Up to 100,000 UI wander and 300 UI jitter generation ranges exceed requirements of G.823, G.824, G.825, and new O.172 Enables full margin testing of low-frequency jitter/wander and full input tolerance testing. 300 UI jitter measurement range allows measurement of Pointer Hits Test set stays in lock, identifies/logs Pointer Hits on PDH service when dropped from SDH network. SDH/PDH line/clock wander and frequency measurement on all installed interface rates Allows diagnosis of network synchronization problems in the field. Full set of standard measurement filters in conformance with new O.172 plus measurements to 0.1 Hz Ensures reliable and accurate measurements of pointer jitter, improves accuracy of line jitter measurements. Full-band jitter measurement (down to 0.1 Hz) allows characterization of phase transients that affect video, ATM, and PDH service quality. MTIE and TDEV wander parameter analysis Real-Time Wander Analyst software provides pass/fail testing to the most recent ITU-T, ETSI, ANSI, and Bellcore standards. Also provides frequency-offset and drift-rate analysis. New O.172 provides requirements for SDH Jitter and Wander test sets and also new requirements for PDH tests, where necessary. The prime purpose of new O.172 is to improve accuracy and consistency of Jitter and Wander measurements between different units. A special focus is the accurate and reliable measurement of pointer jitter. Only test sets conforming with O.172 can provide the minimum acceptable performance level. Legacy O.171 provides requirements for PDH Jitter test sets. The measurement range is only 10 UI so overload can easily occur. The measurement filter accuracy is not specified so results can vary widely. As a consequence, the measurement error is too high. O.171 test sets are unable to guarantee reliable and accurate pointer jitter measurements. Therefore it is important for users to ensure that test sets conform to new O.172. The Tektronix CTS850 is the first Jitter and Wander test set to meet the new requirements of ITU-T O.172 (together with O.171). CTS850 performance easily exceeds O.172 with modern DSP-based Jitter and Wander measurement technology (old analog techniques typically provide less performance). Wander generation of 100,000 UI exceeds the specified minimum requirement of 14,400 UI (STM-4). Jitter measurement range of 6 and 300 UI exceeds the specified minimum requirement of 200 UI (STM-4). Jitter measurement filter accuracy of better than 10% exceeds the specified minimum requirements of 10% (O.172). Jitter measurement filter performance to less than 0.1 Hz exceeds the tolerance requirements of O.172. Meets ITU-T G.703 Pulse Masks. Unbalanced BNC, 75 Ohm to ground. Opt. 11: 1.6/5.6, 75 Ohm to ground. Meets ITU-T G.957 Eye Pattern Masks. C2 byte is set to 00. Bulk fill set to 00. Bulk Fill in a selected AU channel. PRBS: 29-1, 215-1, 220-1, 223-1; All 1s, All 0s, 8-bit programmable word. PRBS patterns can be inverted. LOS, LOF, LSS (Pattern Loss). RS-TIM, MS-AIS, MS-RDI, AU-LOP, AU-AIS, HP-RDI, HP-TIM, HP-PLM, HP-UNEQ, LP-RDI, LP-RFI, LP-TIM, LP-UNEQ, LP-PLM, TU-AIS. ±2 dBm, typical: For input power in a range of -30 dBm to -6 dBm. Resolution 0.1 dBm. Monitors a selected channel while passing the signal through unchanged, both electrical and optical. Set overhead bytes to any value from binary 00000000 to 11111111: A1, A2, J0, E1, F1, D1 to D3, D4 to D12, K1, K2, S1, M1, E2. View all Section Overhead bytes. Clear text decode of S1 message byte provided per G.707. Orderwire Access to E1 or E2 byte from RJ11 jack. Insert data from the Overhead Add/Drop connector into the Section DCC, Line DCC, E1, E2, or F1 user byte. Drops data from the Section DCC, Line DCC, E1, E2, or F1 user byte out to the Overhead Add/Drop connector. PRBS evaluation is provided internally for bytes E1, E2, F1, F2, D1 to D3, D4, to D12. Set the APS Bytes, K1 and K2, to any code defined in ITU-G.783 Annex A and G.841. Selectable by clear text for all Span and Ring messages. Set Path Overhead bytes to any value from binary 00000000 to 11111111: C2, G1 (bits 5 to 7 only), F2, H4 (bits 1 to 6 only), F3, K3, N1. View all Path Overhead bytes. Clear text decode of C2 signal label per ITU-G.707. Path Label Mismatch (PLM) and Unequipped (UNEQ) detection. Insert data from the Overhead Add/Drop connector into the F2 user byte. PRBS can be used through F2 internally. J1 HP-Trace: VC4 Overhead - User-defined 15-byte with CRC, or 64-byte formats per ITU-T G.707. J0 RS-Trace: User-defined 15-byte with CRC per ITU-T G.707. Single - Single pointer justification. Burst - Bursts of two to eight pointer justifications spaced four frames apart. All adjustments within a given burst are in the same direction. Subsequent bursts are in alternating directions. Continuous - Pointer justifications occur continuously at a predetermined rate in an incrementing, decrementing, or alternating direction. Rate between movements: 2 ms to 10 s, with a resolution of 1 ms.
Set to Value - Set to a new location with or without the NDF being set. Range is 0 to 1023 (783 to 1023 are illegal locations). Phase Transient Pointer Adjustment Burst. Pointer Direction - Positive or Negative. 30-second burst of 1 pointer per second in the same direction as the selected test, per ITU-T G.783. This will last at least 60 seconds, for an integral number of complete sequences, per ITU-T G.783. Simultaneous PDH mapping frequency offset with ITU-T G.783 Pointer Sequences generation. To enable the measurement of combined mapping and Pointer Jitter. SDH Anomalies - Error Count, Error Rate, and Errored Seconds for: B1, B2, B3, TU Path BIP, Payload, MS-REI, HP-REI, LP-REI. Network Defects (Seconds) - LOS, LSS (Pattern Loss), CTS Loss of AC Power. SDH Defects (Seconds) - RS-TIM, MS-AIS, MS-RDI, AU-AIS, AU-LOP, HP-RDI, HP-TIM, HP-UNEQ, HP-PLM, LP-RDI, LP-RFI, LP-TIM, LP-UNEQ, LP-PLM, TU-AIS. AU Pointer Measurements - NDF Sec., Illegal Sec., +Ve Just. Count, -Ve Just. Count, Illegal Count, NDF Count, Pointer Value. RS B1, MS B2, Path B3, AU-LOP, AU-AIS, HP-REI, HP-TIM, HP-PLM, HP-UNEQ, LP-REI, LP-TIM, LP-UNEQ, TU-LOP, TU-AIS Seconds and ratio. Errored Blocks, ES, %ES, SES, %SES, UAS, %UAS, CSES Periods, Background Block Errors, %Background Block Error, Path UAS, %Path UAS. Performance analysis performed as per user settable allocation percentage for SDH and PDH. Regeneration Section, Multiplex Section, high- and low-order path layers are individually evaluated. Analysis Results: Pass or Fail. Pattern Bit Seconds and % of total time. Error-Count, ES, DM, SES, UAS, EFS. B1, B2, B3, RS-TIM, MS-REI, MS-RDI, MS-AIS, AU-AIS, AU-LOP, HP-REI, HP-TIM, HP-UNEQ, HP-PLM, HP-RDI, LP-REI, LP-TIM, LP-UNEQ, LP-PLM, LP-RDI, LOS, OOF, TU-LOM, TU-AIS, TU-LOP, TU-BIP. Errored Blocks, ES, %ES, SES, %SES, CSES, UAS, %UAS, Background Block Errors, %Background Block Error, Path UAS, %Path UAS. Custom (User Controls Performance Limits). Automated Test types allow Performance Analysis for Regeneration Section, Multiplex Section, high- and low-order path layers based upon user-settable allocation percentage. Custom test type allows the user to select the performance objective limits. The data format can be built upon the pattern generator framed or unframed output at the PDH line/mapping rate or upon multiple layers of user-configurable sub-multiplexing. A specific hierarchy of tributaries can be selected and filled with a background pattern. TU12, TU3, or AU4, but not at same time. Single - Single pointer justification (increment or decrement). Burst - Bursts of two to eight pointer justifications spaced four multiframes apart. All adjustments within a given burst are in the same direction. Subsequent bursts are in alternating directions. Continuous - Pointer justifications occur continuously at a predetermined rate in an incrementing, decrementing, or alternating direction. Rate between movements: 48 ms to 10 s, with a resolution of 1 ms.
Set to a new location with or without the NDF being set. TU12 Range is from 0 to 1023 (140 to 1023 are illegal locations). TU3 Range is from 0 to 1023 (783 to 1023 are illegal locations). Meets or exceeds the requirements of ITU-T G.823, G.825, O.171. Exceeds requirements of ITU-T O.172. Jittered Line Output - Sinusoidal modulation of transmit clock frequency, applicable to any SDH or PDH data rate, except 8 MBps (E2). Jitter Frequency Range - 12 µHz up to 5.00 MHz. Jitter Amplitude Range - Up to 300 UI. Wander Amplitude Range - Up to 100,000 UI. *1 When equipped with bulk fill payload. ±5% ±0.06 UI, at 622 MBps Line Output. ±5% ±0.04 UI, at 622 MBps Clock Output and 45 MBps Line Output. ±5% ±0.03 UI, for all other rates, Line or Clock Output. Amplitude Resolution - 0.01 UI. Frequency Accuracy - ±1%, below 1.00 kHz; ±5 ppm, above 1.00 kHz. Frequency Resolution - Three decimal places. Jittered Clock Output - Operates in addition to the jittered line output. 0.8 Vpk-pk output (for all rates) is AC-coupled and terminated with unbalanced 75 Ohm. 2 MHz G.703 output is compliant with G.703 2048 kHz synchronization interface specifications. Nominal Clock Rates - 2 MHz, 34 MHz, 140 MHz, 52 MHz, 155 MHz, 622 MHz, or 45 MHz. Can be set independently of transmit-line rate. Connector - Rear-panel, unbalanced 75 Ohm BNC. Peak-to-peak or RMS jitter measurement of the Clock or Line input. Meets or exceeds the requirements of ITU-T G.783, G.823, G.824, G.825, G.958, O.171. Exceeds requirements of new ITU-T O.172. Jitter Measurements - Peak-to-peak Jitter (UI), Positive Peak Jitter (UI), Negative Peak Jitter (UI), Jitter Hit Seconds, Jitter Unlocked Seconds, RMS (UI). 5% A ±0.035 UI (except 622 MBps). 5% A ±0.07 UI (622 MBps only). Frequency Response - For f, HPI > 0 dB/decade, down to 0.1 Hz. Pointer Event Seconds, Current Frequency Drift Rate (ppm/s), Maximum Frequency Drift Rate (ppm/s). Current Frequency, Maximum Frequency, Minimum Frequency. Normal Resolution: 0.005 UI. Resolution is 0.1 UI for Fullband (0.1 Hz Highpass). Resolution for RMS is 0.001 UIRMS. Extended Resolution: 0.01 UI, except fullband 0.1 Hz, 0.1 UI. Input Phase Tolerance - Input phase tolerance exceeds 300 UIpk-pk, to accommodate worst-case tributary pointer jitter, exceeding requirements of new O.172. Built-in conformance tests automatically execute jitter/wander tests according to the relevant standards for equipment and network interfaces. Output Jitter: ITU-T G.823, G.824, G.825. Input Jitter Tolerance: ITU-T G.823 (Standard and National), G.824, G.825, G.958 (Type A/ B). Jitter Transfer Function: ITU-T G.735, G.751, G.752, G.958 (Type A/B). Pointer Jitter : ITU-T G.783. For extended range, fixed error shall be less than or equal to 0.1 UI plus the value listed above. For RMS measurements, fixed error shall be less than or equal to 0.01 UIRMS at all rates. Jitter Measurement Accuracy - Jitter measurement accuracy is a function of the modulation frequency and the highpass filter chosen. Measured jitter frequency response is expressed by the equation below, where fLC is the lower cutoff frequency and fUC is the high-frequency cutoff (defined in table following). Passband is from fLC to fUC. Uncertainty = ±5% A ±fixed error, where A is the actual jitter at the input. Measurement function meets the requirements of new ITU-T O.172 (supports ITU-T G.783, G.823, G. 824, G.825, G.958, etc.). Lower cutoff (highpass) is first order (-20 dB/decade). For E1, E3, and E4, this response is 20 dB/decade down to less than 0.1 Hz in wideband mode. Upper cutoff (lowpass) is third order (-60 dB/decade). Cutoff frequencies are ±10% except E1 (2 MBps) is +100%/-10%. Jitter Clock Input - Input to measure jitter on a clock signal. Nominal Clock Rates: Any supported SDH or PDH rate, except 8 Mbps (E2). Rate is independent of the receive line rate. Frequency Tolerance: Nominal rate ±100 ppm. Input Amplitude: 0.4 Vpk-pk minimum, 1.5 Vpk-pk maximum amplitude. Connector: Rear-panel, unbalanced 75 Ohm BNC. Jitter Output - Demodulated jitter from the receiver. The output is filtered by any measurement filters selected. Connector: Rear-panel 50 Ohm BNC. Normal measurement range: 100 mV/UI. Extended measurement range: 2.65 mV/UI. Output Level, typical: ±1 V, centered at 0 V ±100 mV. Accuracy: ±10%, in addition to measurement inaccuracy. <10 seconds wideband or highband or fullband (10 Hz) highpass filter. <30 seconds fullband, 1.0 Hz highpass filter. <60 seconds fullband, 0.1 Hz highpass filter. Supports ITU-T G.813, G.812, ETS300 462-n and O.171. Exceeds requirements of O.172. Peak-to-Peak Wander, TIE (Time-Interval Error)/MTIE, TDEV, Current Frequency, Maximum Frequency, Minimum Frequency. Input Wander Tolerance: ITU-T G.823 (Standard and National), G.824, G.825, G.958 (Type A/B). Conformance tests use the selected data or clock input/output signals and then automatically choose the correct test signal format, adjust parameters as needed, and display the test results in graphical and/or text format. Default test parameters are provided and are selectable/adjustable by the user. Results may be stored to floppy disc or printed to printer and/or floppy disc (BMP format). Graphical results have interactive cursors for value readout, plus tabular reporting of results. Standard specification limits are displayed for pass/fail determination. Range: 0 to 300 UIpk-pk; refer to Jitter Measurement specification. 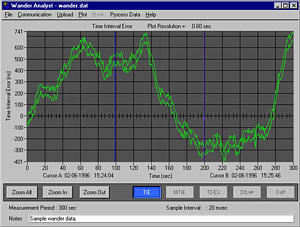 Test: Measures wideband and highband jitter over default measurement interval of 60 sec (selectable 1 sec to 99 days). Results: Output jitter (UIpk-pk) with specification limits. Range: 0 to 2x tolerance mask specification; refer to Jitter/Wander Generation specification. Test: Measures tolerance to jitter/wander at a number of frequencies (selectable 6 to 48) over a range of frequency (selectable from 12 MHz to 5 MHz); onset of errors or 1 dB power penalty technique. Results: Input jitter/wander tolerance graph with specification limit mask or tabular report. Real-Time Wander Analyst software works in conjunction with the Tektronix CTS850 or SJ300E test sets. The software provides full wander TIE, MTIE, and TDEV analysis according to the most recent ITU-T, ETSI, ANSI, and Bellcore standards. The Windows-compatible PC software uploads TIE wander measurement data from the test set at a sampling rate of 50 Hz (in accordance with ITU-T and ETSI requirements), stores the data at a rate of 50, 1 or 0.1 Hz (selectable) and simultaneously calculates MTIE and TDEV using efficient algorithms. In addition to the ITU-T and European ETSI specifications, real-time Wander Analyst also includes a full suite of North American SONET and ANSI specification limits. The software provides a hi/lo envelope TIE plot to show transients, full zoom control using cursors, and calculates frequency offset and drift rate in accordance with ANSI-approved methodology. Results can be easily transferred to other Windows applications for report documentation. Data Communication Channels and User Channels. A DB-37 female connector provides the interface to an external protocol analyzer. Clock and data signals are differential TTL, conform to V.11 specifications and are also compatible with single-ended TTL signals. Laser - EN60825 (class 1), 21 CFR 1000 (class I).